Aim: To assess the level of hormones in chronic kidney disease (CKD) patients and the effect of renal transplantation (RTx) on these hormones. Materials and methods: 17 patients enrolled and levels of 11 hormones i.e. FT3, FT4, TSH, FSH, LH, prolactin, testosterone, cortisol, growth hormone, PTH and insulin were measured in every patient before and at 1st, 3rd and 6th month after RTx with correlation to serum creatinine. Patients with underlying endocrine disorders were excluded. Result: At 1st and 3rd month of follow up after RTx, there was no statistical significant change in the hormones level except in PTH, which normalised (Pre transplant levels: 262.542 ± 239.706 and 1 month levels: 101.412 ± 66.615 p = 0.024 at 3rd month level: 113.02 ± 95.960 p = 0.036). At 6th month, along with PTH, LH level decreased significantly (LH level pre-RTx 8.387 ± 4.536 and 3.091 ± 2.139 at 6th month p = 0.024). Levels of other hormones also normalised. Mean serum creatinine at 6th month had increased from its nadir level post RTx (1.149 ± 0.164 mg/dl to 1.386 ± 0.323 mg/dl p = 0.034), due to rise of serum creatinine in 4 patients. FT3, cortisol, prolactin and insulin levels also increased in parallel with serum creatinine, however insulin level correlated significantly (r = 0.759 with 95% CI = 0.015–0.962). Conclusion: RTx corrects most of the hormonal disturbances in CKD patients, particularly abnormalities in PTH and LH levels in early post transplant period. Even mild allograft dysfunction significantly affects the hormonal levels in a manner which is similar to the changes seen in CKD. Aim: To identify the major challenges faced by bone marrow donor registries in India. Materials and methods: HLA typing, using the Sequence specific oligonucliotide probe (SSOP) Luminex-xMap technology, was performed for all 18,000 donors. Haplotype analysis was performed using the Arlequin software. Results: In a cohort of 18,000 donors only 19% patients could find a donor at 10/10 low resolution level. The chances of finding a donor at high resolution 10/10 level is even less. The major challenges faced are lack of awareness, patient's economic status, unavailability of unrelated matched donors, lack of funding for function of registry and high donor dropout rates. Conclusion: As cost is a major challenge, we need to strive to increase donor pool and also take major steps to decrease the donor dropout rates by increasingly motivating potential donors and trying to help them overcome any myth or fear from donating stem cells. BK virus nephropathy (BKVN) is recognized as a one of the major causes of renal allograft loss in recent years. A number of successful retransplantation have been reported worldwide, however the Indian data is singularly lacking in the same. Additionally, the need to perform an original graft nephrectomy before retransplantation is a debatable issue. We report a case of successful retransplantation in a young male with previous graft loss due to BKVN which to the best of our knowledge is the first reported case in the Indian literature. Objective: The purpose of this report is to present an atypical manifestation of primary cutaneous nocardiosis disseminating to the brain, ear and epidural space resulting in an abscess formation and subsequently acute cord compression. If presented with epidural abscess with acute cord compression, it is a surgical emergency. Case report: A 47 year old post renal transplant patient had right lower limb monoplegia with mixed upper and lower motor neuron signs which could not be corroborated. MRI of the whole spine could characterize a lumbar epidural abscess. She was operated laminectomy decompression of L3 and lavage done. Brain MRI showed multiple brain abscesses. Culture and microscopy identified nocardia species. Linezolid and cotrimoxazole was started. She responded fast to recover completely in three months. Conclusion: The clinician should maintain a high index of suspicion for Nocardia infection when dealing with immunocompromised patients with atypical presentation especially with neurological involvement. The diagnosis of Nocardia infection is made via culture and specimen smear morphology. Balanced surgical and medical line of treatment is to be individualized for each patient according to the dissemination, phenotype and host status. We report a case of a renal transplant recipient treated with tacrolimus, who developed Thrombotic microangiopathy (TMA). TMA is a well-documented, severe and acute adverse effect of tacrolimus that occurs after solid-organ transplant. He was managed with complete withdrawal of tacrolimus, increasing the dose of mycophenolate mofetil and plasmapharesis with fresh-frozen plasma as replacement fluid. This was resulted in normalization of renal functions. The remission was sustained during follow-up of 12 months. Introduction: Severe acute graft dysfunction due to vascular complication need prompt decision regarding the type and need of intervention. But many times imaging may not give the definitive diagnosis. Vascular complications continue to account for about 3–15% of the cases of graft dysfunction. Aims and objectives: We analyzed the clinical features, investigations and intervention done in the cases of possible acute vascular complications post renal transplant. 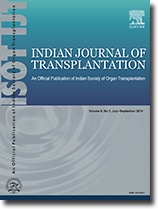 Methods: 50 patients who have undergone renal transplant at Bombay hospital were studied. Three cases having graft dysfunction in early postoperative period with reported significant vascular pathology on imaging were analyzed. First case had severe renal transplant graft dysfunction on 4th postoperative day (POD) with angiography suggestive of renal artery narrowing requiring re-exploration. Second case had iliac vein thrombosis close to renal vein anastomosis managed conservatively with good outcome. Third case was reported on Doppler ultrasound as compromised renal blood flow. Conclusion: 3 out of 50 renal transplants at our institute over 15 months follow-up had been reported as early vascular complications. One patient required re-exploration. Appropriate evaluation and management is the key to salvage the graft. Atherosclerosis (donor/recipient), acute rejection, delayed graft function increase this risk. Patients with history of solid organ/bone marrow transplantation, chronic renal failure and hypertension are known to present with a sudden neurological deficit and a multifactorial clinicoradiological syndrome called posterior reversible encephalopathy syndrome (PRES). Occurrence of vasogenic edema is well demonstrated on magnetic resonance imaging (MRI) which tends to resolve with medical therapy. Here we report a case of post-renal transplant recipient with graft failure showing typical manifestation of PRES and its successful medical management.